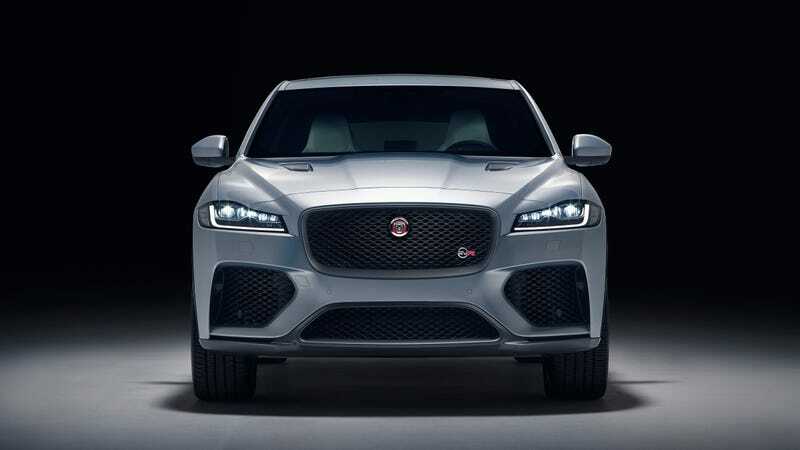 We had some qualms with Jaguar Land Rover’s E-Pace performance capability, but the automaker sure seems to have delivered on performance with the new F-Pace SVR, which is debuting at the New York auto show this week. A supercharged V8 is packed under the hood and it’s supposd to deliver 550 horsepower. Alright now. Jaguar was already busy on Tuesday, announcing a new partnership with Google’s Waymo to build new autonomous all-electric I-Paces. But enough about automated cars. The 5.0-liter engine has been deployed by Jaguar in other models, and it sure is a doozy, delivering 502 lb ft of torque and delivering 0-60 in 4.1 seconds. It has a top speed of goddamn 176 mph. Wooosh. It’s not all about the engine, though. Jaguar says the front and rear springs are 30 and 10 percent stiffer, respectively. The automaker says that, along with an incorporated anti-roll bar specification, contributed to a 5 percent reduction in body roll. The SVR comes stocked with 21-inch wheels; an inch wider is optional. Inside, the vehicle comes stocked with tech-heavy equipment: 4G WiFi to handle eight devices, a 10" touchscreen, along with a 12.3 HD instrument cluster. The car’s expected to arrive at dealers later this year carrying a price tag of $80,000.